Kicking off a full week of beautiful real room makeovers is Emily of Go, Haus, Go! She is a fellow 'midnight hustler' (love that term!) who blogs at night after slaving a full day away in some other profession. Her blog is only a few months old but is already full of inspiration. Just take a look at the whimsy she injected in to her laundry room. Take it away Emily. Hello there! I'm Emily from Go, Haus, Go!  I'm so happy and honored to be here on Brooklyn Limestone sharing a recent project of mine with you. For those of you unfamiliar with Go, Haus, Go! my home is a 900 square foot 1914 brick cottage in a little neighborhood just south of Cincinnati in Covington, Kentucky. I've just started on my home (and blogging!) so lots of things to make pretty and share with you all. Now for the fun stuff. My laundry room makeover! It's a very small space at about 28 square feet, but with it located right off the kitchen and viewable to everyone, it was important it looked nice. It also needed to satisfy a couple of needs - functional decor, flow with the adjacent black and white kitchen and last but not least, the design needed to cover up my not-so-lovely washer and dryer hook-ups. I'm all about doing things inexpensively in my home so I knew I would be warming up my crafting muscles and DIY-ing something(s). Here's how the room looked when I started. Yikes. I didn't clean up prior to taking this photo or even use the good camera. Chalk it up to ugly room syndrome. -The stripey curtain was DIY'ed using a white tie-up curtain. Details on that project here. And because I was all about adding function with the decor, the mirror (from Pottery Barn Teen) doubles as a hook for drying tank tops and bras. The Polaroid wire (from Ikea) morphs into a convenient clothesline when guests (or cameras) are not around. I'm very happy so far! To follow the laundry room makeover adventure from start to finish (seriously, it was like four posts) scroll to the end of this post. Great work - although it was just your small & quirky laundry! I like the idea with "clothes line" for the polaroids...! Lovely...very inspired to try a few of your ideas myself. I think it was great that you followed your instincts. Especially love that you made the stripey curtain. Love this! It's so cute! Love the fabric panel! Thanks for sharing. Hello from Lexington. Love the fabric panel to cover the water/hose hook-up. Be sure to read our guest blog this Thursday. The string of polaroids is the cutest idea! Absolutely in love! Gah, I need to work on my laundry room! LOVE the picture clothes line! Im going to have to incorporate that...somewhere! Thanks everyone for the nice comments! Great day! Looking forward to the rest of the Real Room series. Hi Janette! I'm looking forward to it! Oh my gosh, I love it! The wallpaper is fabulous and the roman shade is really neat! Love that you DIYed it, too. :) Well done! P.S. I also like the photo display near the ceiling! Cute little addition to the space. what a great idea! this is awesome I have this electric plug and water outlet I would love to cover up and use this idea! Thanks for sharing! LOVE this makeover! Very pretty and bold!